June 2016, as the request of customer, ZOOMLINE delivered two engineers to Thailand. 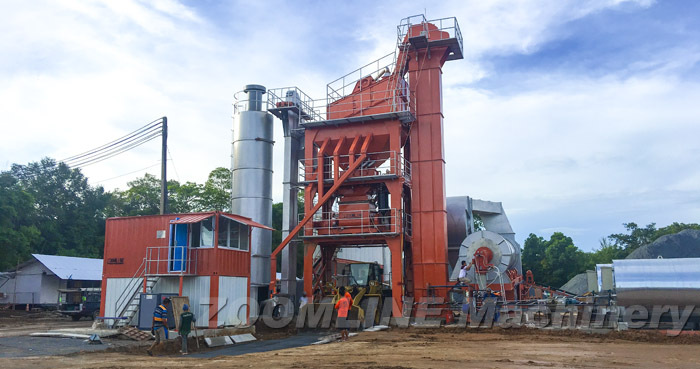 Engineers helped local workers about erection and operation of ZAP-S120 asphalt plant. And did on-site training about later period operation and maintenance. With effort of both sides and one month’s busy work, the equipment can produce successfully. Equipped with five aggregate silo, each silo can be frequency controlled, and no material flow measuring device also be equipped. 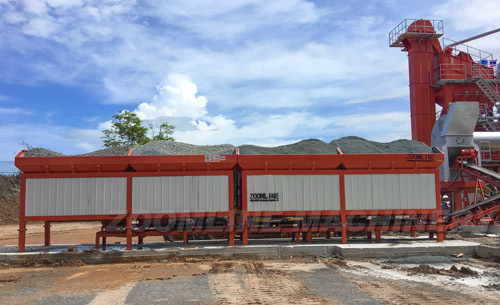 When aggregate’s moister is 3%, production of drying drum can reach 140t/h. When moister is 5%, production can still reach 120t/h. Roller bearing is equipped with automatic lubricant device, reduce labour intensity greatly, improve safety and reliability of equipment, keep longer service life of bearing. This oil burner have stable flame, easy operation, can control temperature timely. Mixing cycle is 45 seconds, volume of each batch is 1500kg, high mixing efficiency, stable quality of finished product, and is equipped with automatic lubricant device. Electrical parts use Germany Siemens, with low voltage protection and overload protection. Weighing senor adopt USA Toledo. Control system have two mode, manual mode and automatic mode, and these two mode can change-over. ZAP-S120 have two dust collection system, working area of secondary bag house filter can reach 500㎡, use impulse dust collection,emission concentration is less than 20mg/Nm3. Equipped with dust humidification mixer, so dust pollution can be reduced. 7.Temperature of finished product is 140-180°C, can meet requirements of different project.